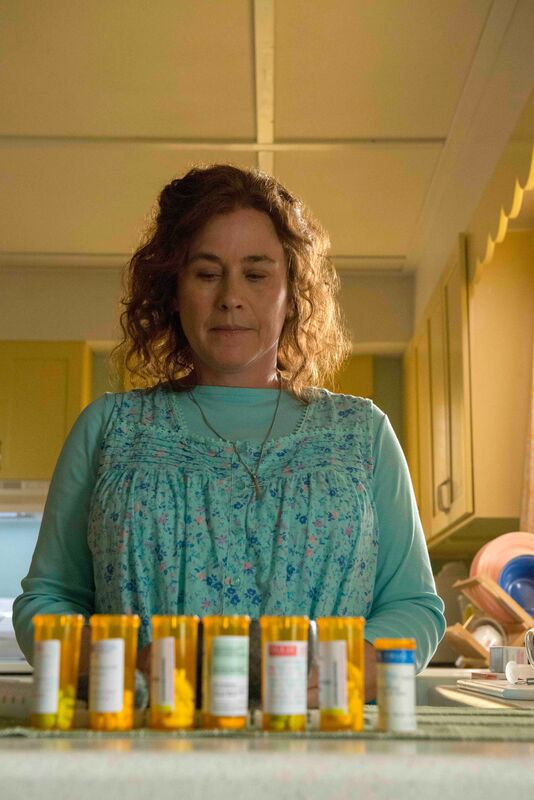 Following a recent spate of successful true crime series, Hulu’s The Act fictionalizes a harrowing truth in limited series form. The murder of Dee Dee Blanchard by her daughter Gypsy Rose and Gypsy’s boyfriend Nick Godejohn first fascinated in a longform Buzzfeed article in 2016, followed by the HBO documentary Mommy Dead and Dearest. In Hulu’s adaptation of the crime, which spans eight hourlong episodes, the bizarre true tale is chronicled rightfully as a slow-burn gothic horror. 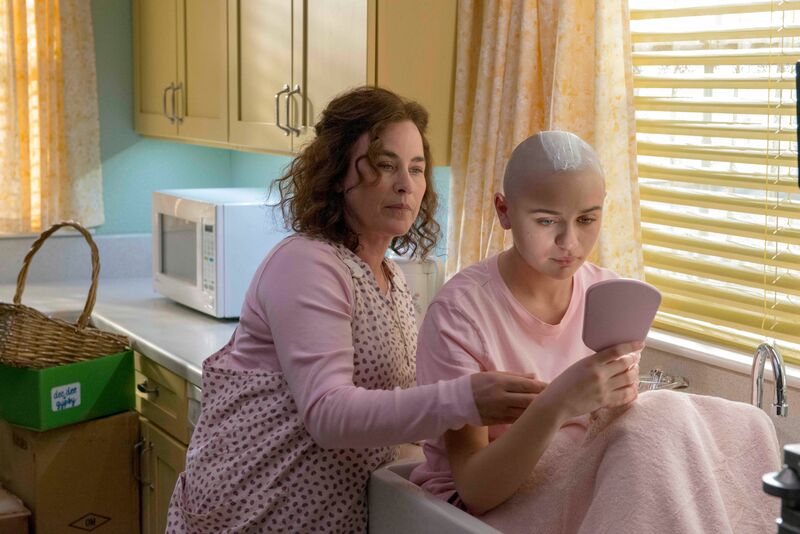 The Act stars Patricia Arquette as the controlling and manipulative Dee Dee, and Joey King as her beleaguered daughter Gypsy, a teen girl who seems to have a laundry list of ailments. She’s confined to a wheelchair, allegedly can’t grow out her hair, is infantilized to look younger, has the mental capacity of a 7 year old (according to Dee Dee), and is missing many of her teeth. She wears big, thick glasses and suffers the indignity of a feeding tube, but seems to have an indomitable spirit. At least, that’s what Dee Dee wants to present to the world. And when The Act begins, it’s mostly true. Gypsy, under her mother’s complete control, refers to her as her best friend. She’s grateful for the help others give her, and is excited to learn everything about the world that she can in her seemingly limited capacity. But almost immediately, there are cracks in this story, especially when it becomes clear that Dee Dee suffers from Munchausen syndrome by proxy, with Gypsy as the true victim. The twisted tale culminates in Dee Dee’s murder, something the show teases from the very start. Gypsy is reportedly kidnapped during the same break-in, and I won’t spoil the details if you haven’t heard more about the story. But The Act draws things out very slowly, starting at a point where Gypsy is beginning to question her mother’s control and lies about her condition. She’s a teenager, and after meeting another teen neighbor (played by AnnaSophia Robb), she begins to crave what all teenagers do — freedom, love, and the opportunity to begin a transition into adulthood. Nothing scares Dee Dee more than Gypsy desiring her freedom, of course, which is why she does things like drug her with “sleepy baby” pills to make her seem incapacitated when a social worker stops by. She has Gypsy’s teeth removed, and then cunningly hands her false teeth at the very moment when a bruised and broken Gypsy has all but given up. Arquette is absolutely masterful here in the way she switches among various facets of Dee Dee’s personality — a loving mother, a venomous jailer, a tired caretaker — all of which add up to the pitch-perfect signs of a master manipulator. Dee Dee is so adept at controlling Gypsy with her own moods that even when Gypsy is offered the chance to escape or counteract her mother (as is the case with a concerned doctor who doesn’t believe she has half the ailments Dee Dee claims), she hesitates. “My mom needs me,” she says tearfully to the doctor before Dee Dee comes bursting in, ever-afraid of a betrayal. Gypsy also continues to use a wheelchair when she doesn’t need to because her mother wants her to, fascinatingly seeming to occasionally forget that she can walk. But as the years wear on and the series continues, Gypsy begins to rebel. She runs off to be with a man she just met, she buys a burner phone, and even gets access to a laptop to create a Facebook profile and later join dating sites. She has become just as adept as Dee Dee in the art of lies and manipulation, using some of her mother’s tactics back on her and those around her to get what she wants. Joey King has clearly spent a lot of time studying the real Gypsy Rose’s unique speech patterns and movements, giving an uncanny performance (at least in the first episodes) as a girl who is much older than she pretends to be (and for awhile, believes she is). That’s certainly nothing new on TV, but in this case, King is able to show how vulnerable and frightened Gypsy is while also portraying the darkness Dee Dee’s abuses have created within her. The simple teen joys of watching makeup tutorials on YouTube and flirting with someone at a convention are juxtaposed with punishments from Dee Dee, including the aforementioned removal of her teeth, or being forced to hold stuffed animals and wear the clothes of a little girl. And for the most part, those around them only glance over and smile, wanting to feel good about being kind to a mother and her child who suffers from so many issues. That’s true even of their suspicious neighbor Mel (Chloë Sevigny) whose own family woes keep her from truly seeing the problems in the Blanchards’ relationship. The best moments in the series, though, are when Gypsy and Dee Dee interact with the outside world; Gypsy, at this point, is often telling lies to her mother in order to make purchases at the mall or do things that she wouldn’t approve of, and there’s an incredible amount of tension as to whether she’ll get away with it before Dee Dee finds out or not. But by the fourth and fifth episode (the last for review), the beats in the relationship between the two women begins to feel repetitive. As engrossing as this story is, the Hulu series — which comes from Michelle Dean and Nick Antosca — starts to lag as it goes on. Maybe there’s a fear that if the events are pushed too closely together they will become less believable to viewers, but this whole story is really a Lifetime movie on steroids to begin with. It doesn’t give Arquette and King enough credit for selling the emotional intensity between Dee Dee and Gypsy and their twisted dynamic, or the power of its natural House of Horrors aesthetic. Things get something of a shake-up when Gypsy’s online boyfriend Nick (Calum Worthy) enters the picture, bringing a certain amount of awkward realism to everything (Worthy embodies a troubled small-town loser exceptionally well). That’s also when things begin to take a grisly turn. Still, The Act might have benefitted from fewer, tighter episodes (with more consistent accents, some of which border on outrageous). It would be fitting for the masterwork storytelling that Dee Dee and Gypsy both engaged in, creating the reality they desired by blurring the lines of fantasy, protecting themselves from confronting their most depraved instincts. The first two episodes of The Act premiere Wednesday, March 20th on Hulu, with subsequent episodes released on a weekly schedule after that.